No harmful fumes means you don’t have to move out of your home or vacate your business. VOC compliant and GREENGUARD certified for indoor air quality. 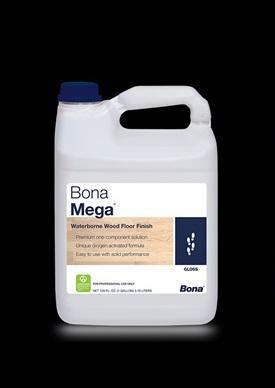 Bona’s advanced-technology, Swedish waterborne finishes are the most durable polyurethane finishes available today. Clear, high-build finishes won’t amber or change color over time, highlighting the true beauty and elegance of wood. Elegant look and noticeably unique feeling underfoot give this finish superb, Traffic-like durability, and because of its natural look, scratch marks are less visible. GREENGUARD Indoor Air Quality Certified. 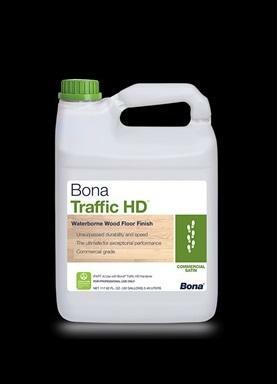 Bona Traffic HD is for hardwood floor owners with an uncompromising attitude towards durability, being green and looking beautiful. Significantly outperforms all urethane finishes in durability at 24 hours. The proven performance and value standard waterborne hardwood floor finish in the industry for residential and commercial floors. 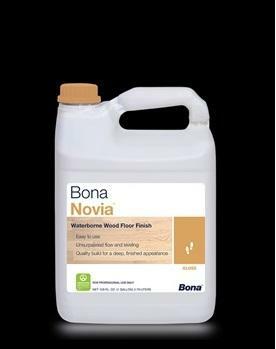 Bona Novia is a budget sensitive, waterborne dependable alternative to any oil-based system.